Innovative single pass frac sand drying minimizes airflow requirements and the need for complex controls. Simple straight-through design reduces weight, while dual feeds improve throughput and deliver a cooler product. MISSION, Kan., Aug. 6, 2018 /PRNewswire/ -- Industrial Accessories Company (IAC), one of the largest EPC contractors for the Frac Sand industry, has developed a state-of-the art advanced Frac Sand Rotary Dryer / Cooler, which has been patented by Industrial Accessories Company (IAC). Recently installed at eight (8) frac sand plants, IAC's new Frac Sand Dryer / Cooler has become a vitally important piece of drying equipment for customers looking to increase production throughput. Many newly operated frac sand plants struggle in the early phases of production to provide washed sand with an optimal moisture content to feed into the dryer. Sand that is too moist creates a production bottleneck in most dryers, which limits production unless the moisture is allowed to adequately decant from the washed sand prior to feeding the dryer. IAC recognized this challenge and set out to improve on existing sand dryer designs. Using proven technology from the U.S. hot-mix asphalt industry and European designs, IAC patented a state-of-the art, single flow, Dual Feed rotary dryer; which greatly reduces the complexity of controls found in fluid bed or counter-current rotary dryer designs. "IAC can assist in the selection of a sand dryer, a critical decision when designing an industrial sand facility. The feed into the dryer, heated air flow and the automation system are especially critical," said Glenn Smith, Chief Executive Officer at IAC. "Our new dryer/cooler can process wetter sand in excess of 8-10% moisture, eliminating costly bottlenecks for sand plants. We added a second wet feed collar to leverage evaporative cooling, so energy costs go down. Best of all, plants can run it 24/7." The ingenious system leverages the inherent material characteristics to speed processing. A partial amount of moist sand feed material is added into a second dryer inlet and blends with the dried, but as yet uncooled product. Evaporation of water from the moist material assists cooling of the remaining dried solids. The heat from the dried solids is used for drying the partial add-in quantity of moist sand. The entire energy consumed for heating the dryer, as well as the entire amount of air for drying and cooling are significantly reduced. Best of all, IAC's smallest patented frac sand dryer technology has proven to process wet sand with 8-10% moisture at a rate over 100 TPH, 5-6% moisture at 160+ TPH and over 250 TPH with 3-4% moisture. 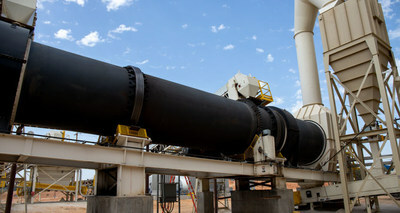 This gives frac sand plant owners options to streamline the flow of production from sand to silo. A simple, straight-through design strips out weight and complexity. Customizable flights protect the equipment from heat and improve surface evaporation through the combustion zone. Rugged, abrasion-resistant materials, thick-walled internals and replaceable parts extend the useful life. "IAC is optimizing production from its patented Dryer / Cooler with dual feeds that can handle wetter sand," said Bob Carter, senior vice president of Frac Sand Operation for IAC. "The results have been so good for our customer, IAC was awarded a second phase. Now, we're doubling their dry plant production with a second dual feed Dryer / Cooler." Owners and operators will soon be able to see the new Dryer / Cooler in person. As a leading EPC contractor supporting the frac sand industry, IAC will have a full-scale Dryer / Cooler with duel feed system, on display at the Frac Sand Equipment EXPO October 23rd preceding the Frac Sand Supply & Logistics Conference October 24-26 in San Antonio. There, IAC will present on their full Frac Sand Industry capabilities, Patented Dryer / Cooler and RCS mitigation, at booths #40 and #50. About IAC: Founded in 1986 Industrial Accessories Company (IAC), is a fast-track, high-technology equipment, EPC Contractor that designs, fabricates, and installs plants and equipment systems to industrial manufacturing companies. As an Engineering, Procurement and Construction (EPC) contract provider serving numerous industries, IAC has delivered countless systems for a wide variety of trusting and satisfied customers. IAC is strategically located in the center of the US in Kansas City, with field offices on the East and West coasts to be responsive to our customers. Visit www.iac-intl.com or contact Mike Sedler - [email protected] or Glenn Smith – [email protected] directly for more information on IAC Frac Industry capabilities and solutions.